Every year for Christmas, I like to buy a board game to play, even though no games better either Ludo (in which my dad is the reigning cheater-champion, and argues to high heaven over the rules about doubling up or how to place your counters in "Home") or Rummikub (which we can now play with two packs of cards lest we forget the game). 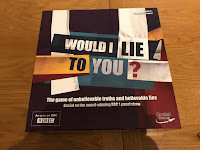 This year, Would I Lie To You caught my eye in Waterstones (other emporiums - emporia? - for book lovers are [locally] unavailable). It's a game, it says, for 2-8 players; however we decided it wouldn't work with 3 of us unless one switched teams each time, so we made our own rules up for scoring and used a pad instead of the game board scoring system. Rolling the die, players move around the board, with challenges arrived at on each turn. There are three types of challenges - nothing like the tangled webs woven by panellists on TV, sadly in a way, but gladly because we haven't got that much time. One where you get to nestle a lie amongst a truth, one where you get to either embellish a lie or make up supporting facts to accompany a truth, or a quick fire "truth or lie" where you invent the lie. Disappointingly, there isn't the option to have a special guest arrive at your home, so unless you open the door to, and then introduce, your neighbour's daughter's hairdresser's boyfriend, you will have to skip that round. We discovered how good, for his age, our 11 year old son was with the embellishing of a fact challenge. The game certainly entertained for over an hour on the last evening of the Christmas holidays, only stopped due to bed time. The best thing was seeing him laugh and smile when he had to be creative - we sometimes thought that gave away that he was lying, but in fact he was just embellishing the truth! Occasionally his mispronunciation gave the game away, but didn't detract at all from the fun we were having. 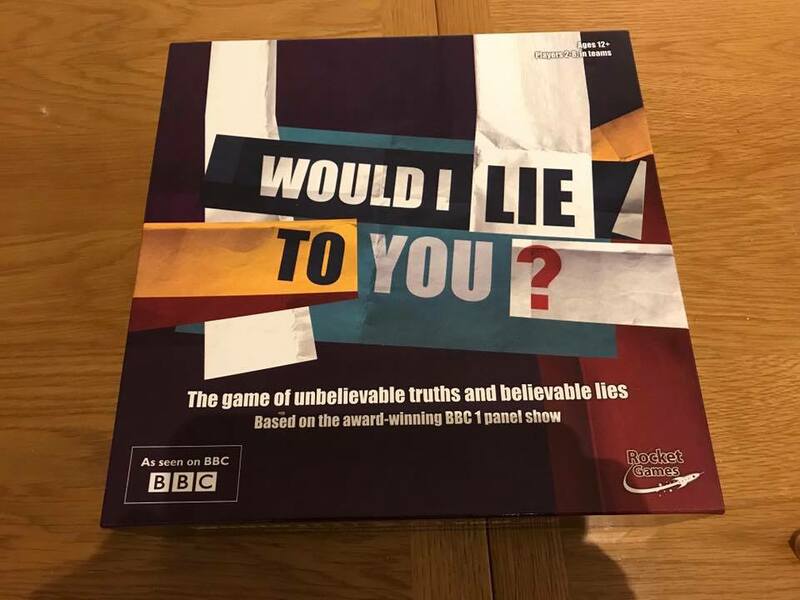 The rules do state that you write down the lies you have made up (you get 30 seconds in an egg timer which you must use, even if you are telling a truth) because it is hard to remember word for word the lie you have invented. I would recommend doing this; we didn't and it did show. In a household totalling a mere three, we aim to play this when our family come next week for our son's 12th birthday. I'm sure with the grandparents added, the game will be even better. Next time, I would like to add a bigger challenge for maybe when the first player reaches 10 points, for example. They could get five minutes to prepare three statements, one of which is a lie, like in the series. Perhaps this could determine the ultimate winner!